If you are a regular reader of this little blog then it will be no surprise to you that I adore the Eiffel Tower. The love affair started when I first visited, aged seven, and saw the majestic structure rising above the beautiful rooftops of Paris. One of my favourite things about this city is the paradoxical nature of the buildings. 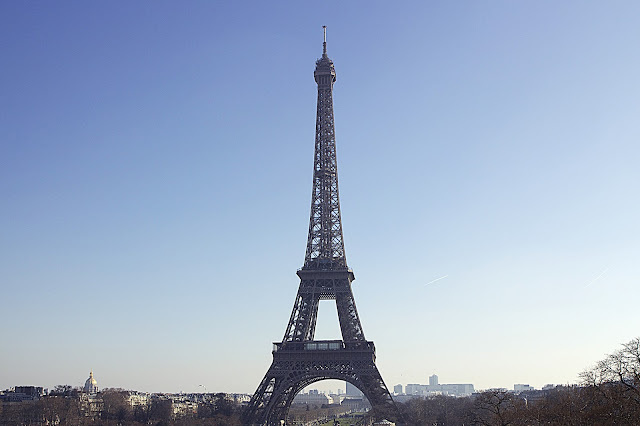 Nothing in Paris is particularly tall, bar the obvious Tour Eiffel and the monstrosity that is the Tour Montparnasse but don’t get me started on that. Yet every lovely building lining the boulevards are four, five, six floors. I myself have the pleasure of living at the top of a six storey building and (except for the lack of lift and one hundred and five stairs) I love it. Plus my thighs are already toning and I will be grateful for it in May! Anyway, back to the Eiffel. When my father was visiting last week we decided it was time to climb up and see the view. Well I say climb, we got the lift. I have over one hundred stairs to climb everyday, I deserve a break once in a while right? First of all we headed to Trocadero and walked through the park, the tower rising in front of us. Queuing up with all the other tourists, I couldn’t help but stare up into the stature and admire the intricacy of the metal work. I don’t think it’s something you appreciate when you’re looking at a postcard or staring at it from the distance, but the structure itself is exquisite. The only problem arrived as we stepped into the lift. As a firm hater of heights, I panicked rather a lot as we ascended diagonally up the north leg. I try to let my fear never get in the way of living – making my self skydive and bungy jump but more on that another time – and so I swallowed my fear and queued for the next level. To say it was worth it was an understatement. Having visited the Burj Khalifa, I am no stranger to heights & views but seeing Paris stretch out in the distance is unlike anything else. I took great delight in trying to spot my apartment (which naturally I didn’t manage to do, but I did sort of vaguely point out the area). Papa and I wandered round, with me playing tour guide and showing him all the sights we’d been at the day before. I found descending was far more preferable, and tested my courage by choosing the stairs. After nervously singing motivational French songs (the best solution to fear, I can promise you), I was delighted to see the buildings getting closer and soon enough we were back on solid ground. Did you know I love the Eiffel Tower? This isn’t the first time I’ve visited, and it certainly won’t be the last. If you liked this post you can read about my other Parisian adventures with Pappi here.